The Taliban continues to make gains in Afghanistan as allies of the war-torn country reduce their commitments of troops and assistance, according to a new Pentagon report. The Defense Department’s June report to Congress, the third in a series required semi-annually by law through next year, illustrates the prevalence of insurgent and extremist groups—including the Taliban, a degraded al Qaeda, and an ISIS affiliate called the Khorasan Province—that continue to "dominate" the security situation in Afghanistan. It arrived before President Obama is due to make a decision on the planned drawdown of U.S. forces in Afghanistan later this year. "Our senior military commanders have been warning for months that the security situation in Afghanistan is deteriorating, placing at risk the hard-won gains of the last 15 years," Sen. John McCain (R., Ariz.), chair of the Senate Armed Services Committee, told the Washington Free Beacon Tuesday. "This latest Pentagon report to Congress points out the dynamic nature of threats in Afghanistan and highlights the need for further development of key capabilities of Afghan security forces." The Afghan National Defense and Security Forces still have "persistent gaps in their capabilities" to fight insurgent and terrorist groups, which demands a U.S. presence in the region to monitor and address threats, according to the report, which covers the period between December 2015 and May 2016. "Collectively, terrorist and insurgent groups continue to present a formidable challenge to Afghan, U.S., and coalition forces. Insurgent forces have been able to demonstrate increasing capability to threaten district centers, particularly multiple district centers simultaneously," the report, prepared by the Defense Department in conjunction with the State Department, stated. "Seeking to exploit weaknesses in the [Afghan security forces] and take advantage of the reduced international military presence, the Taliban continue to expand their influence, especially in rural areas of the country that lack effective Afghan government representation." While Afghan forces generally remain in control of major population centers and key lines of communication, the Pentagon says the Taliban and extremist groups have demonstrated "resiliency" by waging attacks in Nangarhar, Herat, Kunduz, and other northern provinces. 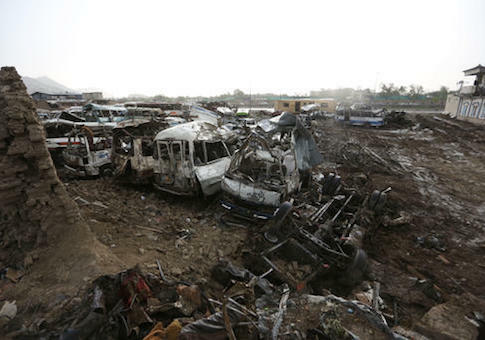 The Taliban also launched attacks and seized territory in the southern Helmand province during the reporting period, in addition to sabotaging a major power line that severed electricity to the Afghan capital for over three weeks. "The Afghan government required more than three weeks to restore power to many parts of Kabul, which undermined public confidence in the Afghan government’s ability to provide basic services as well as security," the Pentagon report notes. The Special Inspector General for Afghanistan Reconstruction told Congress in January that the Taliban controlled more territory than at any point since the 2001 invasion of U.S. troops, echoing data compiled by the United Nations last fall. The Taliban has increasingly targeted more urban areas with high-profile attacks, causing the count of civilian casualties to spike to high levels. According to figures released by the U.N. in February, more than 3,500 civilians were killed and 7,500 wounded in hostilities in Afghanistan last year, a record high number of civilian casualties. The Pentagon report, citing data collected by the Resolute Support Civilian Casualty Mitigation Team, documented 2,496 civilian casualties—including 760 deaths—between January and May of this year. The Taliban claimed responsibility on Monday for a suicide bombing in Kabul that killed at least 14 people. "The stability of Afghanistan is a critical U.S. and global security interest. Afghan forces haven’t developed the maturity to be on their own and we can’t pretend that will happen anytime soon," Rep. Duncan Hunter (R., Calif.), a member of the House Armed Services Committee and former Marine, told the Free Beacon in reaction to the Pentagon report. "Until it does, we’ll have a presence in Afghanistan and probably need to keep some forces there even after it does, in order to ensure security gains hold." The deteriorating security conditions in Afghanistan have led Obama to scale back his planned drawdown of U.S. forces in the country. Obama, who marked the end to combat in Afghanistan two and a half years ago, signed off on a plan last year that would leave the current level of 9,800 troops steady through most of this year and reduce it to 5,500 by the time he leaves office. The administration is said to be rethinking that in light of the current security environment. "The decision that President Obama makes on whether or not to draw down from 9,800 to 5,500 U.S. troops in Afghanistan will have major consequences for the security and stability of Afghanistan," McCain said. "In Iraq, we saw what happened when troop levels did not reflect conditions on the ground. We cannot afford to make that same mistake again." He encouraged the president to make a decision as soon as possible "to give our allies and partners the confidence to make their plans to support operations and development efforts in Afghanistan and send a clear signal to the Taliban that they cannot simply wait us out." Obama may wait until after the NATO summit in Warsaw next month to make a decision on the troop level, according to Reuters. NATO countries could be more willing to maintain their presence in the country if the United States slows its withdrawal of forces. Former U.S. commanders earlier this month urged the president to keep troop levels steady through the remainder of his term. The Pentagon report addressed the current force draw down plan, noting that it will "limit some functions" and result in a U.S. military presence at a small number of bases in Kabul and Bagram with regional outstations. Still, the report says that the United States will be able to tailor its efforts to continue to advise and assist Afghan forces as well as deter and disrupt regional threats. "This posture reflects a consolidation of U.S. forces and takes advantages of efficiencies gained by working with and sharing functions with coalition partners and the ANDSF," the report notes. The Pentagon also indicated that the persistent threat of groups such as the ISIS affiliate Khorasan Province, designated a terrorist group by the State Department in January, demands continued U.S. military presence in the region. "Counterterrorism efforts in Afghanistan have helped to ensure that there has not been another major terrorist attack against the U.S. homeland since September 11, 2001," the report said. "However, the existence of other extremist groups in Afghanistan, such as IS-K, requires a U.S. presence in the region that can monitor and address threats, even as the United States builds an Afghan capability to deter terrorist exploitation of Afghan territory." This entry was posted in National Security and tagged Afghanistan, Pentagon, Taliban. Bookmark the permalink.